BM-productions Windows Media Player Plus! BM-productions > Programs > Windows Media Player Plus! 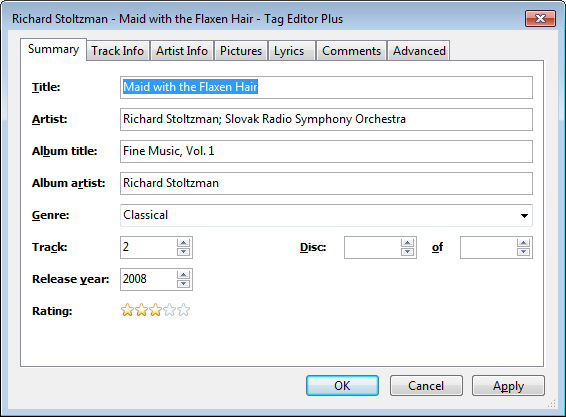 Tag Editor Plus: an alternative for Windows Media Player's Advanced Tag Editor (screenshot). Tag Editor Plus works on Windows Media Player 12 too, where the original Advanced Tag Editor has been removed. Global hotkeys, allowing you to control Windows Media Player from within any running application. Party Shuffle: a dynamic playlist that automatically gets filled with randomly picked songs. Of course, you can still add songs yourself, and reorder/remove songs, just like with a normal playlist. Very useful while throwing a party, as a DJ aid, or just for casual listening. Real 'find as you type' in the media library: you can simply start typing to search, without having to click on the Search field first. Disc number ('set') support in the media library: shows disc numbers in the Track number column and makes Windows Media Player use the disc numbers for sorting the tracks of an album (screenshot). 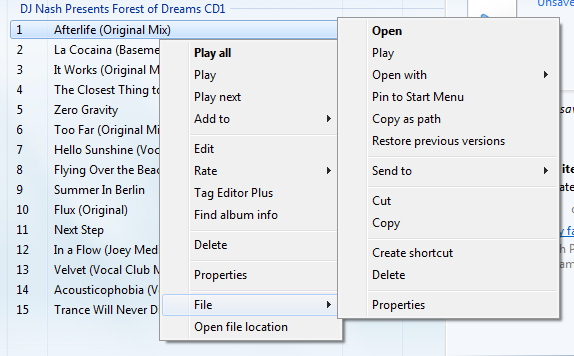 Access the standard Explorer right-click menu of a media file directly from within Windows Media Player (screenshot). Show currently playing media in Windows Media Player's title bar (screenshot). Advanced playback options: Stop after current and Close after current, to automatically stop playback or close Windows Media Player when the current media has ended (screenshot). Let Windows Media Player play/pause when you press the space bar. Disable group headers in the Library Pane (screenshot). 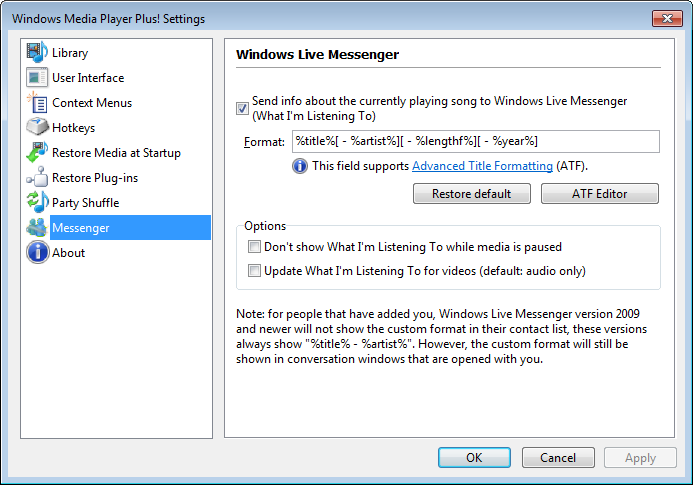 Enhanced and configurable replacement of the Windows Live Messenger Music plug-in (What I'm Listening To) (screenshot). Access the properties/settings of any Windows Media Player plug-in from within the main menu (Tools - Plug-in properties), without having to go to Options first (screenshot). Bring back the "Find in library" right-click option of older versions of Windows Media Player to Windows Media Player 12. "Play next" option when right-clicking a media item in Windows Media Player 11's library (Windows Media Player 12 already has this by default). Quickly re-enable all plug-ins after a Windows Media Player crash (screenshot). Comments, questions, problems, bug reports etc. can be posted in the Windows Media Player Plus! thread at the Hydrogenaudio Forums.